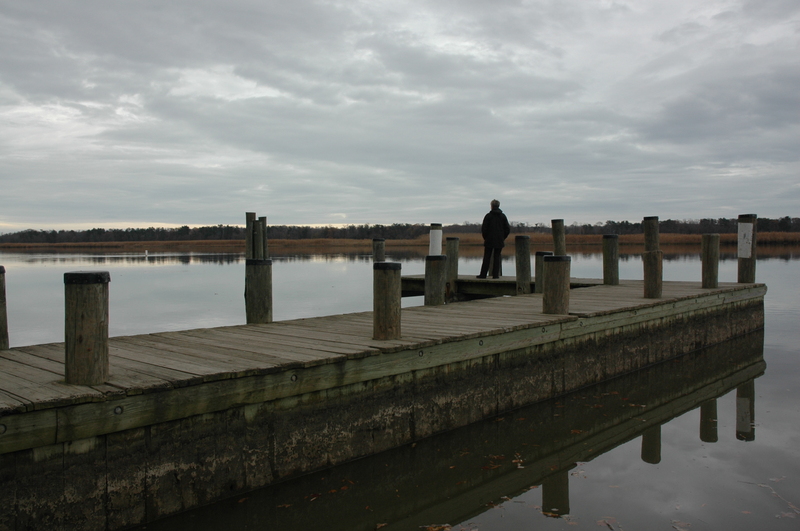 A November visit to Magruder’s Landing on the Patuxent River…with a glimpse of Anchovie Hills. Anchovie Hills lies on the SE corner of the intersection of Croom Road and Magruder’s Ferry Road, in Brandywine, Maryland. 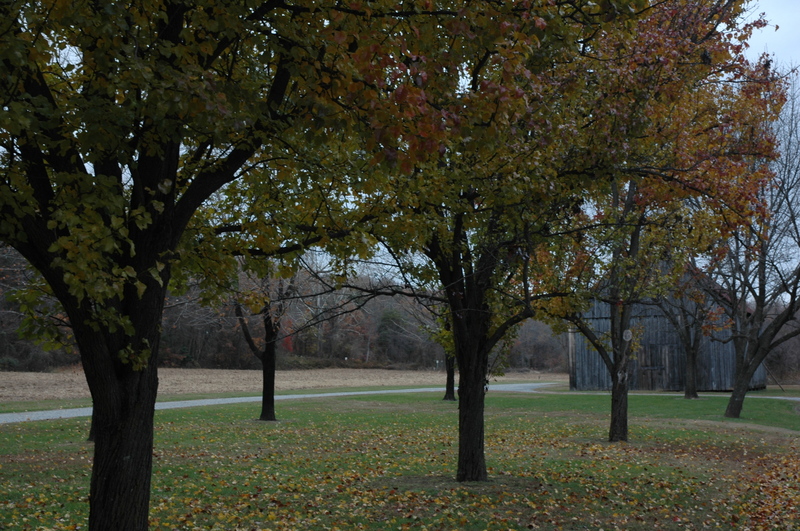 Magruder’s Landing and tobacco warehouses were on the banks of the Patuxent River at the end of Magruder’s Ferry Road. Thanks to the current owner and her family, the remaining 171 acres of Anchovie Hills are permanently protected from development. Its wild residents are further protected from hunting and trapping. Please remember that Anchovie Hills remains a private home and there is no public access. Respect the privacy of those who have ensured the permanent protection of this beautiful and historic site! Click here to see more about the Anchovie Hills Wildlife Sanctuary, including a short video of the property. 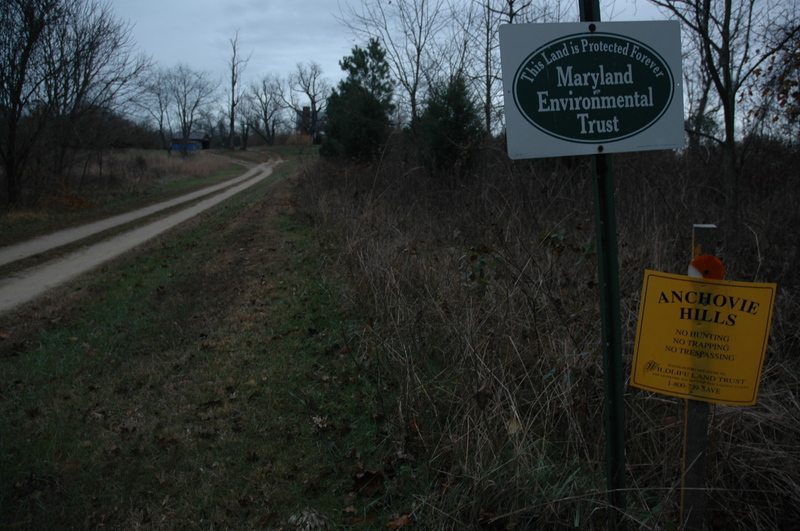 Anchovie Hills entrance on Croom Road, signs from the two land trusts that protect it from development. Photo: Margaret Yocom, 2013. 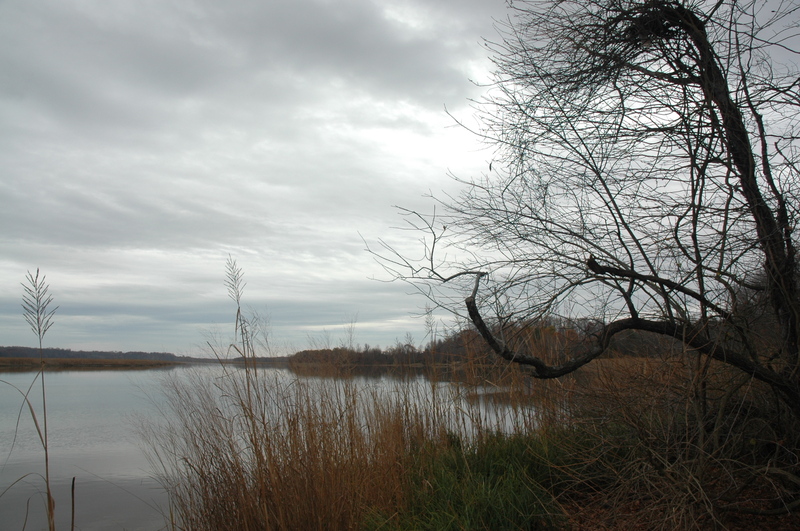 To reach the site of Magruder’s Landing, and the present-day boat ramp, turn down Magruder’s Ferry Road. Anchovie Hills woodland, from Magruder’s Ferry Road. Photo: Margaret Yocom, 2013. At the end of the road, you’ll arrive at signs for Patuxent River Park, and a gate across the road directly in front of you–probably closed. If you turn right, you’ll reach the small park and boat ramp; but if you walk past the closed gate toward the river you’ll reach the site of the last Magruder warehouse on the site. 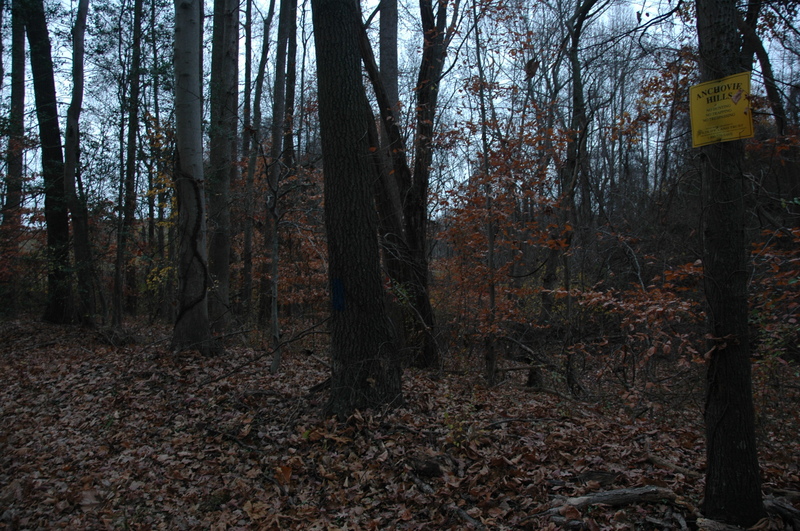 Approach to site of Magruder warehouse, at end of Magruder’s Ferry Road. Photo: Margaret Yocom, 2013. In 1661, Alexander Magruder acquired a tobacco landing–that is, a warehouse and shipping point for the export of tobacco. 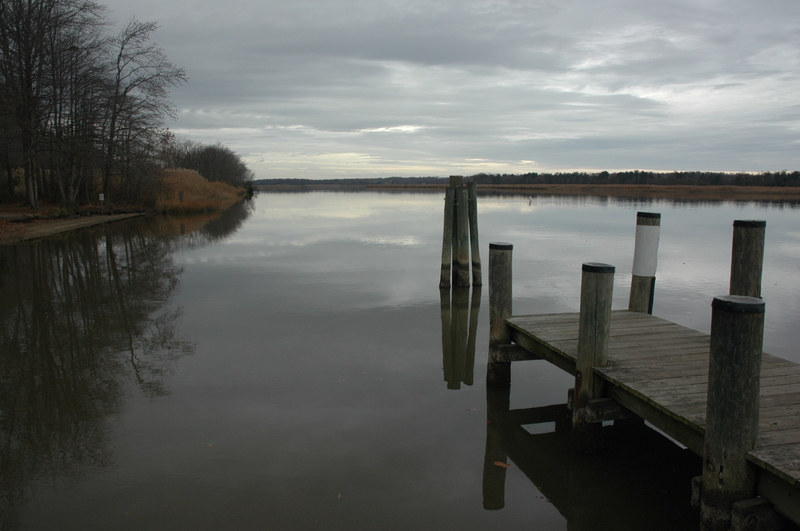 This stretch of the Patuxent River was a half mile wide in those days, deep enough for ocean-going ships to anchor in the channel. From there, traders sent small boats to the various landings along the river bank–Magruder’s, White’s, and Milltown landings are names that survive onto modern maps. Site of Magruder’s warehouse, burned by the British in 1814. Photo: Margaret Yocom, 2013. So, what makes the landings important? After all, Alexander also planted and sold tobacco, along with most of his neighbors; so what’s the big deal about the landing? The answer is: reliable income. Tobacco was early Maryland’s only significant export crop–in fact, it served as the colony’s currency, with prices for labor and goods recorded in pounds of tobacco. The price of tobacco was notoriously unstable, causing multiple problems for the economy. Yet in good times or bad the planters had to ship it out, and those who owned landings profited. Alexander already owned several tracts of land before he acquired the landing–it certainly wasn’t his only asset–but its reliable income undoubtedly contributed to his wealth. In the 1980s, historian Russell Menard studied the wills and estates of 56 Maryland men of Alexander’s generation who arrived in Maryland after 1650 as indentured servants, and later obtained their freedom. About 75% of them acquired land, with most holding 50-400 acres. Only three of the 56–including Alexander Magruder–owned more than 1000 acres when they died. Where, exactly, was the original landing? Hard to say. 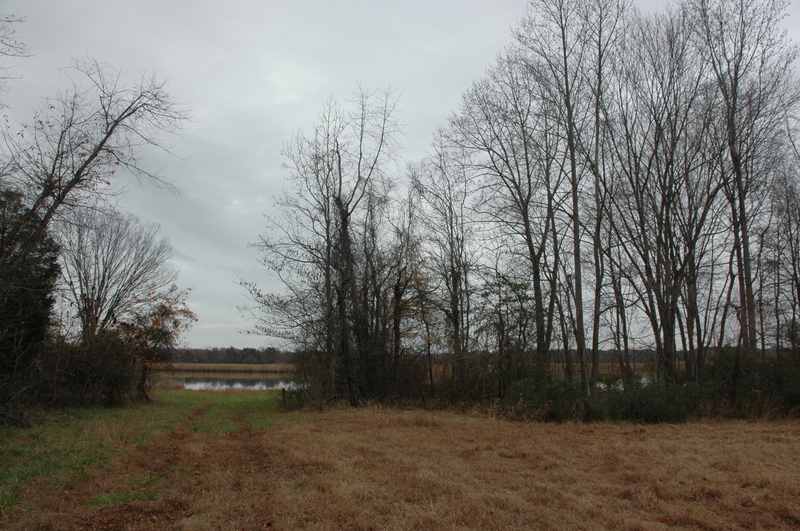 Magruder’s Ferry Road–in its lower stretch just a track through the trees and fields–bends upstream along the river bank for a ways, leading into a larger segment of the Patuxent River Park just north of where these photos were taken. Was the original site here, where the last warehouse stood? Was it somewhere else along that road? Was it just to the south, at the present boat ramp? If anyone knows, please get in touch! Ruined pier, Magruder’s Warehouse site. Photo: Margaret Yocom, 2013. Now, walk back past the gate and take the side turning toward the boat ramp. When I last visited, this was still called “Magruder’s Ferry,” but new signs have dropped the name, identifying it only as part of the Patuxent River Park. Nice place for a picnic, if it weren’t November. (Seems it’s always November when I visit.) Note the tobacco barn. This shot looks back from the parking area toward the entrance. 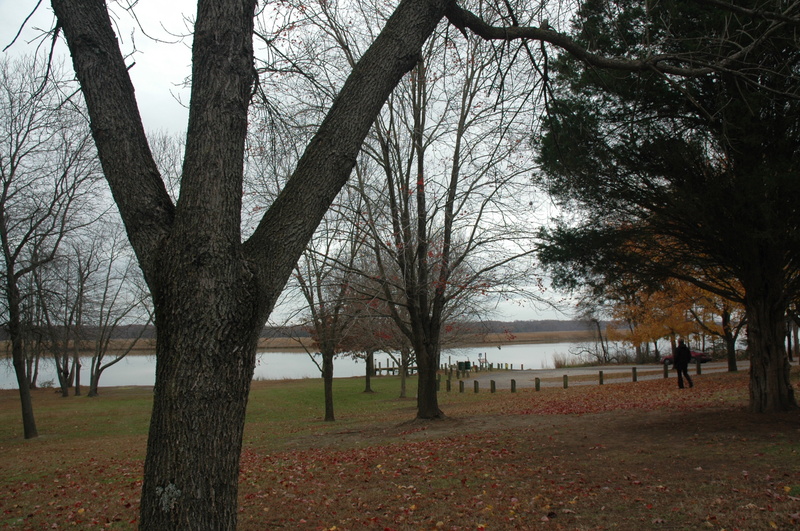 Patuxent River Park. Photo: Margaret Yocom, 2013. Approach to the boat ramp. Photo: Margaret Yocom, 2013. Yep, that’s me. And here I am again, on the pier. The warehouse site is to my left, slightly upstream. Pier, Patuxent River at the boat ramp. Photo: Margaret Yocom, 2013. And here’s me pinpointing Anchovie Hills and the site of the warehouse, on a map showing early plantations in Prince George’s County. 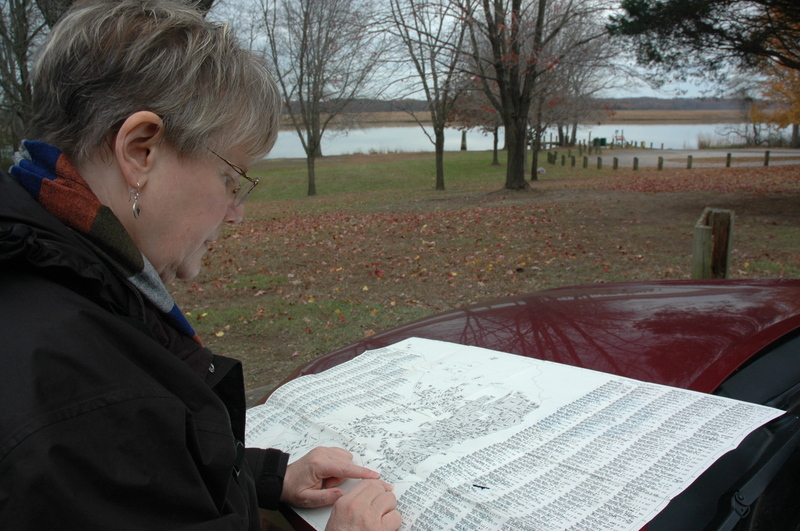 Susan Tichy at Magruder’s Ferry, with map of early plantations in Prince George’s County. During preparation for the 2014 bicentennial of the British invasion of Maryland, the burning of Washington, and the shelling of Baltimore–during which Francis Scott Key composed the words of The Star Spangled Banner–the state of Maryland revamped its presentation of the Magruder’s Landing/Magruder’s Ferry site. At the boat ramp we found this new sign, commemorating the burning of the Moil and Magruder warehouse at the old landing site, in June 1814. Seems it made the papers in New York! (If you have trouble reading the sign in the photo, you can find the whole text at the Historical Marker Database. 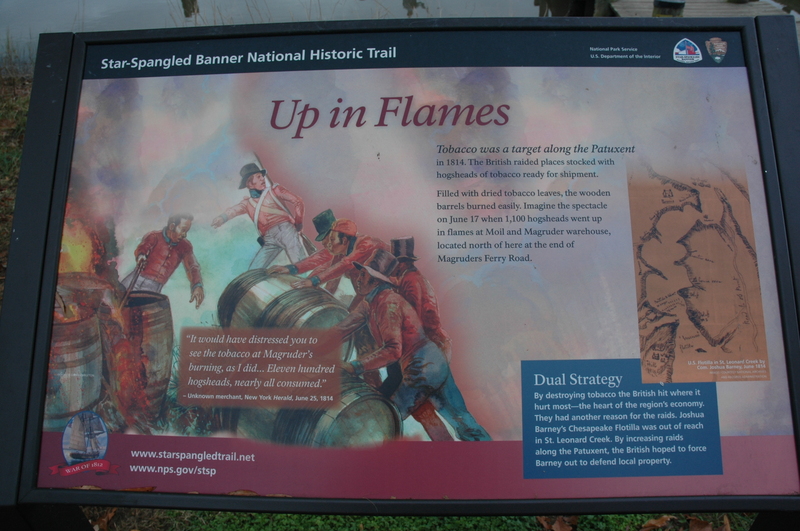 Or learn more about the War of 1812 in Maryland via the Star-Spangled Banner National Historic Trail. Sign commemorating the 1814 burning of the Mails Magruder warehouse by British troops. And then we just hung out and enjoyed the view. Looking downstream from the boat ramp. Photo: Margaret Yocom, 2013. 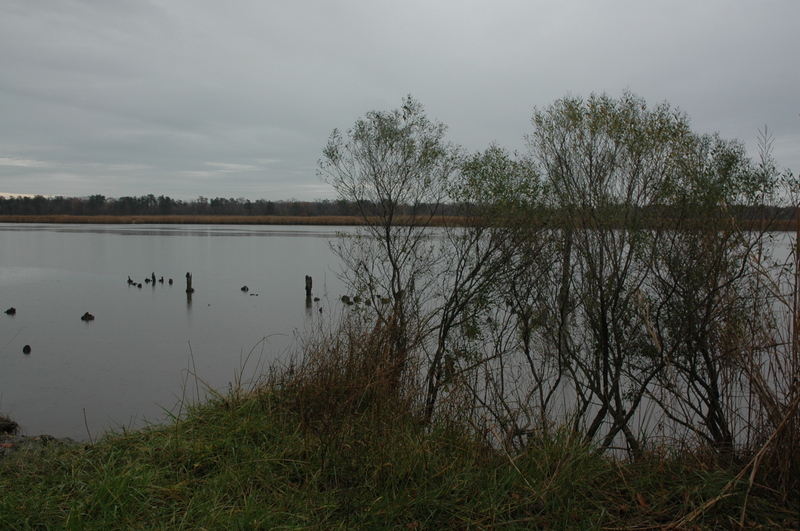 Looking upstream from the boat ramp, toward the site of the Magruder warehouse. Beautiful and very interesting! Thanks for posting. November suits the landscape and story. A pleasure to read. We are alexander magruders relatives in oregon and looking to cement some history back to scotland, although our young children would hardly believe that these beautiful photos from maryland connect to them. Appreciate everything you do! Thank you. I’m glad you enjoy it! Thanks, Don! You can bet I will. Hi Jennifer. Thanks for your comment. 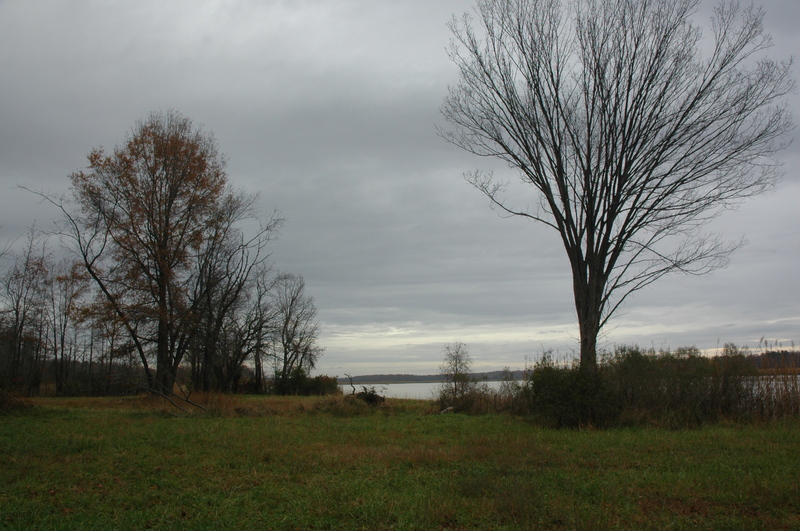 Part of the land may have looked as it does today, but the flat land by the river would have been under intense cultivation, first by Native Americans and then by the settlers. That area was what they called an old-field, meaning it already had been cleared and farmed by the Indians–which made it desirable b/c you didn’t have to wait two years to turn a profit as you did on newly opened land. It’s a great place to visit, very peaceful. Hi Jennifer. Reading this and seeing the photos brings back many childhood memories, as this is the place where I grew up. From age 5 to 15 (1948 – 1958) I lived on the exact property (a 75 acre tobacco farm) where the boat ramp now exists. The house I lived in was located at the top of the sloping hill just off the left as you drive up Magruder’s Ferry Road. My bedroom on the 2nd floor of that house faced the river and provided a grand view especially when the moon and sun rose over the river. That particular house was torn down after I left and replaced with the structures you see there now. The owners of the house I lived in were Leslie and Evelyn Goldsmith, who were my foster parents for those 10 years. I think they bought the farm from his uncle (Ned and Agnes Goldsmith) who lived across the road. I and my brother (3 years older than I) worked in the tobacco fields, and I helped build the barn that still stands on the property. I have many memories of this place, including when the wharf at the end of the road was still in operation, mostly to transport lumber not tobacco. If you have questions, I may be able to provide some answers. I didn’t know it was the site of a tobacco warehouse burned in the War of 1812. I wonder if that structure could have also been located at the wharf site?? I remember many old wooden posts at various places along the river, but believed most were just for fishing purposes. Thanks for the history. John: Somehow I missed your comment last August–must have been rushing that day and approved it without having time to respond. Thanks so much for sending your memories. Some interest is developing among Magruders/McGruders for a marker of some kind at the site of the landing, so at some point I may take you up on that offer re: questions. I’m sure we’ll have a boatload. Beautiful photos and fascinating history. Makes me proud that my grandmother was a Magruder: Ruby Eleanor Magruder Duvall, daughter of Samuel Wade Magruder. Thank you so much for this wonderful information. We are planning a trip in May to visit Maryland again and will be going to Selby’s Landing and Magruder’s Landing. Where did you get of map of early plantations in Prince George’s County? I would love to have a copy for when we are there. I am a descendent of Alexander Magruder via Sarah and William Selby.